Blood trickles down a mock severed head resembling President Donald Trump. 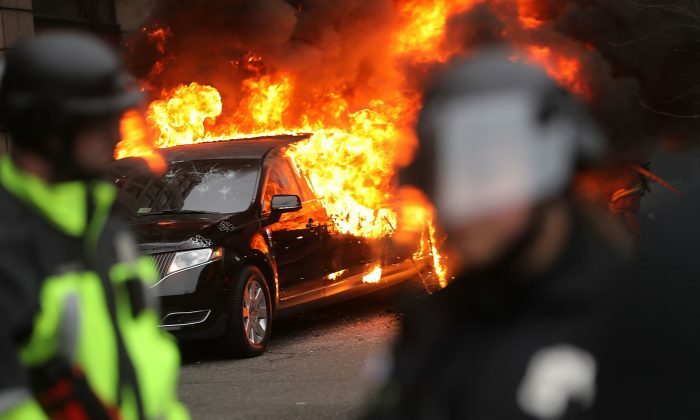 Flames engulf a black limousine in the nation’s capital as protesters look on. Celebrities and television hosts talk about assassinating the president, blowing up the White House, and hoping for a recession. These clips of some of Trump’s staunchest opponents are part of a montage posted on YouTube on June 26. The video is not a product of an internet meme factory but a new advertisement paid for by the Republican National Committee and posted on the official GOP channel. The advertisement, titled “Unhinged,” features Democratic Rep. Maxine Waters encouraging supporters to form crowds and harass members of the Trump administration in public spaces, comedian Samantha Bee using a crude word to describe the president’s daughter, and rapper Snoop Dogg shooting a mannequin resembling Trump in the head. The images have become a creepy new norm since Trump shocked the world by winning the presidential election in 2016. Trump’s opponents have employed radical rhetoric and violence against his supporters and staff since the early days of his presidency. And they haven’t backed down. In the month of June alone, three Trump administration officials were harassed in public and forced to leave restaurants. A Hollywood actor called for the president’s son, Barron Trump, to be “ripped from his mother’s arms and put in a cage with pedophiles.” A Democratic Party volunteer in Florida threatened to kill the children of Republican Congressman Brian Mast. Prior to Trump, the Republicans would not have dared to go on the attack in such a bold manner. The unprecedented advertisement suggests that the GOP is learning from Trump by weaponizing the alarming rhetoric of their opponents against them. Commentators on both sides of the political spectrum have warned that extreme rhetoric and the recent public harassment of Trump cabinet members can backfire in the 2018 election since voters would sympathize with the victims. With the new ad, the GOP is taking advantage of the tide. Trump allies and conservatives flooded Twitter with praise. “The best political ad I’ve ever seen,” wrote Dan Bongino, a former Secret Service agent and frequent Fox News commentator. “This ad created by the GOP is brutal, and demonstrates why liberalism is not learning lessons after 2016,” wrote Andrew Walker, an ethicist with the Ethics & Religious Liberty Commission. The ad was released with the latest news about the harassment of Trump administration officials still fresh in Americans’ minds. On June 17, White House adviser Stephen Miller was chased out of a restaurant and called a fascist. On June 19, chanting protesters forced Secretary of Homeland Security Kirstjen Nielsen to cut short a dinner. And on June 22, White House press secretary Sarah Sanders was asked to leave a restaurant in Lexington, Virginia, because she worked for the president. The day after Sanders’s ejection, Waters called on her supporters to form crowds around Trump administration officials in public spaces. The Secret Service has since installed a detail at Sanders’s home. Pelosi uncharacteristically rebuked Waters for the comments. Senate Minority Leader Chuck Schumer (D-N.Y.) echoed Pelosi’s rebuke. “I strongly disagree with those who advocate harassing folks if they don’t agree with you,” Schumer said according to CNN. The string of public harassment is not a new phenomenon. Trump administration officials, allies, supporters, and Republicans, in general, have faced an unprecedented onslaught of harassment and threats since Trump was elected in 2016. Republican Arizona Rep. David Schweikert said that he received more death threats in 2017 than in the six prior years he served in Congress combined. “There’s an absolute attempt to dehumanize anyone who disagrees, and particularly the rage is off the charts right now because our philosophy is actually working,” Schweikert told Plaidcat, a Republican podcast. Communism has caused the deaths of more than 100 million people over the last century through famine, political killings, and genocide.